Have scientists discovered a recorded sound of MH370 crashing into the Indian Ocean? Australian researchers say it’s unlikely, but they’re investigating it. A TEAM OF Australian researchers looking into the disappearance of Malaysia Airlines Flight 370 have released data about an unusual underwater sound recorded around the time the plane vanished, though the lead scientist acknowledged the chances it is linked to the jet are slim. 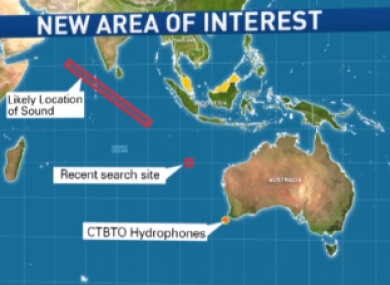 The low-frequency sound was picked up by underwater listening devices in the Indian Ocean off the west coast of Australia on 8 March, the same day the Boeing 777 disappeared on a flight from Kuala Lumpur, Malaysia, to Beijing with 239 people on board. CNN has an audio clip of the underwater recording. Researchers at Curtin University in Western Australia have been analysing the signal to see if it may be the sound of the plane crashing into the ocean. But Alec Duncan, who’s heading up the research, said the sound appears to have originated well outside the jet’s projected flight path that officials determined based on satellite and radar data, and is therefore unlikely to have come from the plane. “It’s one of these situations where you find yourself willing it all to fit together but it really doesn’t,” said Duncan, senior research fellow with Curtin’s Center for Marine Science and Technology. The noise could have come from a natural event, such as a small earthquake, Duncan said. He put the chances of it being linked to Flight 370 at less than 20 per cent. Soon after the search for the plane moved to the southern Indian Ocean, scientists from Curtin decided to check the data from their underwater acoustic recorders off Rottnest Island, near Perth, to see if they’d picked up anything of interest. The scientists normally use the recorders for environmental research, such as studying whale sounds. This time, however, the data showed a signal that they initially thought might be the aircraft crashing into the ocean — an event that would have produced a low-frequency sound that can travel thousands of kilometres under the right conditions, Duncan said. The team then checked data from underwater recorders off the southwest tip of Australia that are run by the United Nations’ Comprehensive Nuclear Test Ban Treaty Organisation in Vienna. One of the recorders had picked up a sound consistent with the original signal. That allowed the team to determine which direction the sound came from — though not its precise location. The scientists then refined the data further and realized the sound originated somewhere south of India — an area well outside the arc of ocean where officials have determined the plane probably crashed. “It’s now looking as if it’s unlikely to be due to the aircraft because it seems to be too far out into the ocean,” Duncan said, though his team was triple-checking their calculations just to be sure. The Joint Agency Coordination Center, which is heading up the search effort, said the Australian Transport Safety Bureau has looked at the research and is discussing it with the Curtin team. “However, Curtin University has concluded, and the ATSB agrees, that the current results are not compatible with the international search team’s analysis of the most likely area where MH370 entered the water,” the agency said in an email. Despite a massive air and sea search, no trace of Flight 370 has been found, three months after it vanished. The search is on hold for two months while new, specialized equipment can be brought in to scour a 700 km by 80 km swath of ocean where officials believe the plane crashed. Email “Have scientists discovered a recorded sound of MH370 crashing into the Indian Ocean?”. Feedback on “Have scientists discovered a recorded sound of MH370 crashing into the Indian Ocean?”.